When your RV needs repair, Diversified can make all the difference. When your RV needs any type of repair (collision, hail or water damage, restoration, fiberglass work, body repair and/or paint) Diversified can make all the difference. We’ve been specializing in servicing, repairing and refinishing large vehicles for over 27 years and we are experts at RV repair. 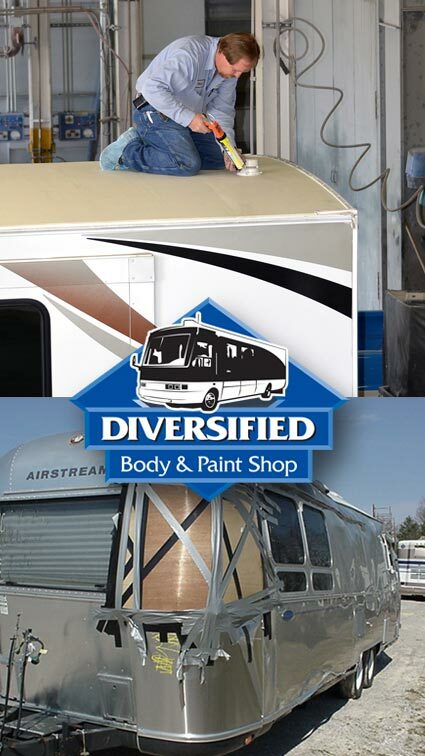 Diversified works on all makes and models of RVs, campers, travel trailers, bumper pull and 5th wheels, motorhomes and motor coaches. We understand how you feel about your RV – it’s your home away from home so we take extra care to give you complete service, professional quality and honest value. All insurance work accepted and we’ll assist you with the process. We also handle factory warranties. All of our work is guaranteed. We promise to provide you the utmost in satisfaction by offering high-quality RV repairs, prompt turnaround times and accurate color matches. We also offer you a place to stay overnight if needed. Guaranteed. In addition to RV repair service, Diversified can locate and order all the RV parts and motorhome accessories you need to keep your recreational vehicle functioning properly.